No hero lives forever, for their story must give way to the next. Thus did even King Arthur, King of Heroes pass in his time. His successors have wielded Excalibur for ages, and now it has fallen to a young attorney in America. His crusades for justice in the courtroom for the downtrodden drew the attention of those beyond his ken and he was ennobled in the middle of his closing arguments. Sadly, his sudden transcendence and accompanying distraction cost him the case. Now he must balance his personal ideals with the truth that not all heroes are nice, but all of them are his. 0 Know when something endangers the Estate of Heroes. 1 Create the memory of a hero. Give someone a temporary role model. 2 Learn the history, location, or actions of a specific hero. Question a statue of a hero directly. 3 Make a hero stronger, faster, smarter, or more inspirational. 4 Create or summon a hero for the occasion. They won't mind, really! Or manipulate their actions directly. 5 Erase a hero, or their weaknesses. Perform divinations using the entire estate, or predict the future. 6 Change who the hero of a story is, or their objective. Make a hero invulnerable to mortal acts. 7 Summon a heroic army, from life or legend. 8 Render my heroic army invincible by destroying their mortality. Erase all memory of a hero like they never existed. 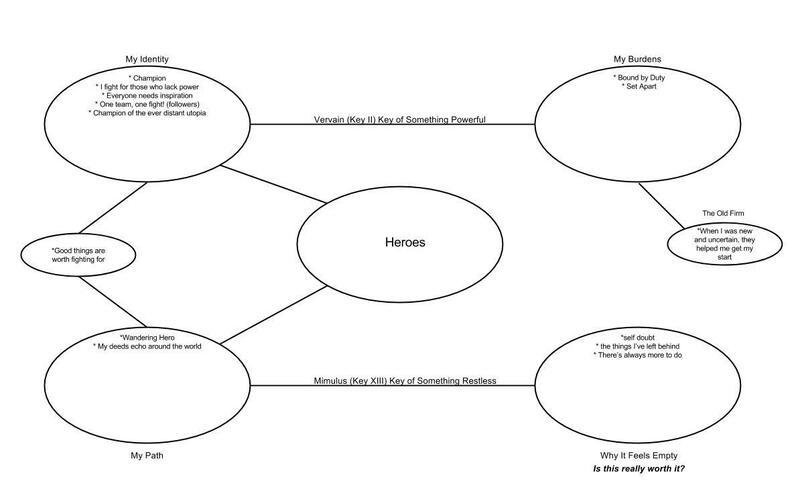 9 Create heroic destinies for people. 0 See heroes, their allies, and their enemies. 1 Make someone more inspirational, or less heroic. 2 Live alongside a specific hero. 3 Embody my estate, becoming more inspirational or memorable. 4 Help a start up owner become a huge success. Make someone volunteer for the suicide mission. 5 Make an investment banker incapable of great success. Incarnate in a hero in heaven, or hell, or all the heroes of earth. 6 Turn a fan into an obsessed stalker. Inspire entire artistic movements when I go to buy coffee. 7 Turn an amateur photographer into an award winning photo journalist. 8 Strip all of Wallstreet of the capacity to beat the market. Doom a city to fade into obscurity. 9 Turn Chicago into the city of Heroes, where those who dare great things gather.